Michelle Mills - Ind. Stampin' Up! Demonstrator Brisbane, Australia: Merry Xmas! 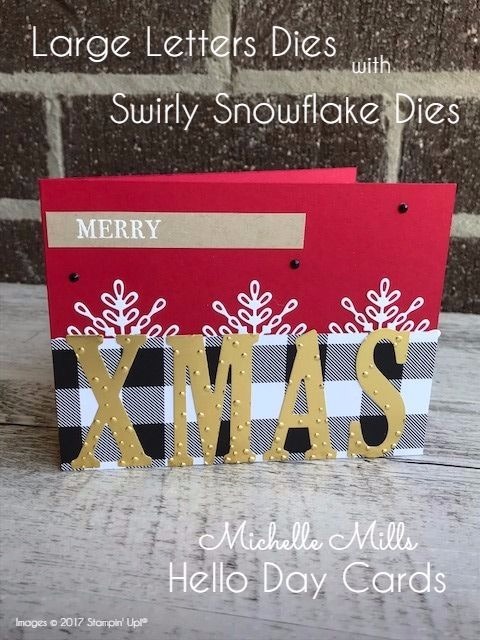 However, when making this card recently, the original plan was to die cut the letters out for the word Merry and stamp the word Christmas. Unfortunately, the Large Letters were too large for the card front and Merry simply didn't fit. So it was time to improvise. The card didn't quite turn out as I had planned but I'm still happy with the result. This layout is quite different and I had seen something similar on Pinterest and really wanted to give it a try. I quite like it. 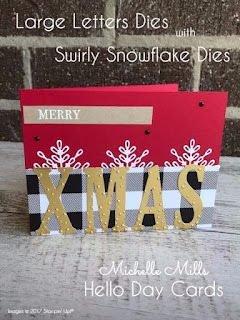 I love how there are 3 elements close together, the paper, the die cut letters and the snowflake dies in their background and then the simple Merry stamped in the top left corner finishes it off. I'm also partial to the colour combo!! Then add some black rhinestones from the Holiday Catalogue and I think this makes a great Christmas card.